Play and learn with the Flags for IOS app. 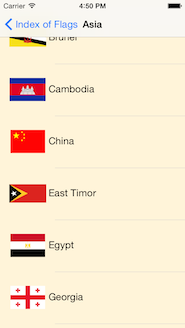 Test your knowledge in the quizzes, or increase your knowledge by using the app as a reference for the flags of the world. Download it today! Flags Play and Learn Released! 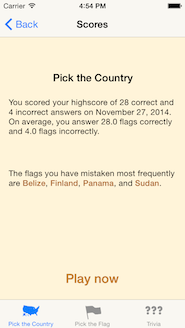 Pick the Country - Find the right country for the flag shown. Pick the Flag - Find the right flag for the country shown. Trivia Quiz - Answer trivia questions about the flags. Look up the flag you are interested in in the index of flags. 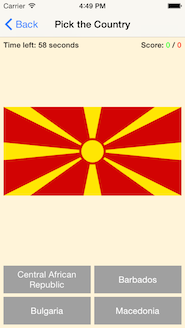 Select a flag, and you will be shown detailed information about the flag. Not sure what a flag-related term means? There is even a glossary included to help you around. Flags are displayed in beautiful detail. 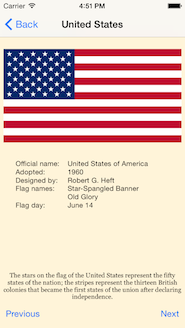 Information included for each flag includes who designed the flag, when it was officially adopted, any names used for the flag, when flag day is celebrated, and some interesting trivia about the flag. You can review your scores for each game mode. Have a minute of spare time? 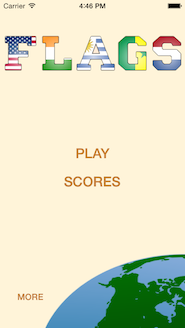 Use it to improve your highscore! Also, feel free to send us feedback, so that when we have some spare time, we can keep improving the app.